What exactly is a Mentalist anyway? Understandably, a Mentalist is not someone you hear about everyday. One definition says a Mentalist is a performer who uses his five senses to create the “illusion” of a sixth sense. Yet another definition (often found in books about magic), is that a Mentalist is simply a talented Magician who does magic “tricks” that claim to be of a “mind-reading” nature. According to Paul, most definitions are either inaccurate, incomplete or just plain wrong! 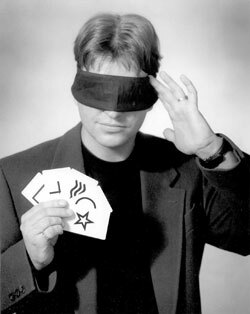 To set the record straight, Paul believes a Mentalist is a performer who uses telepathy, the power of suggestion and sound psychological principals (i.e. : body language, NLP, voice impressions, micro-expression, etc...) to perceive and influence the thoughts of his audience. Most importantly, Paul‘s main ingredient is SHOWMANSHIP which he uses to tie his show all together and make it an entertaining experience! Does Paul need any special requirements? Not really... Paul‘s main tool is his mind; consequently his requirements are very few and far between. He has entertained in every possible venue from Sushi bars to cemeteries! He can accommodate crowds as few as 15 to as many as several thousand. Obviously, for larger groups Paul will request specific lighting and sound equipment. Generally, the most he will ever ask for is a glass of water to sip on. Does Paul collect secret information about his audience in advance? Due to the growing number of mediums/psychics on T.V. who may utilize this idea, lately this question seems to come up a lot. Paul actually PREFERS not to know anything about his audience prior to his performance. Indeed, he would rather not even MEET anybody from his audience before his show. You can guarantee that when your thought is picked up by Paul that you will be meeting him for the first time at that exact moment! The bottom line is that he prepares absolutely NOTHING in advance. Paul uses no paid secret assistants of any kind in his show and he will relinquish his fee to anybody that can prove that he does. For anyone who doubts Paul‘s ability, this should sway their opinion. What if Paul‘s audience members have thoughts they would rather keep to themselves? The real stars of Paul‘s show are the audience members themselves. Unlike at a concert, where the audiences are simply passive listeners for example, Paul‘s audience members become active PARTICIPANTS in the telepathic experiments. Without thoughts to read, Paul‘s show would be very short indeed! Paul realizes that he too has thoughts he would rather keep to himself, and therefore understands your desire for privacy. If Paul perceives a thought that you would rather keep to yourself, rest assured that Paul will keep the secret (you may get a wink and a smile from him however).